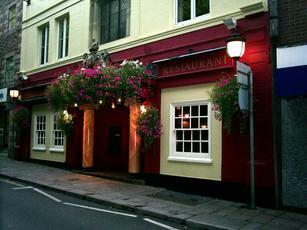 Large, roomy and rather dark pub not far from The Lamplighter. No cask ales on when I was there. Popped my head inside as I was passing the other day and was pleased to see 2 handpumps with Skinners "Betty Stoggs" and Shepherd Neame "Spitfire" on draught. Didn't stop but it was an encouraging sign although this place still is more of a nightclub than a pub. It's virtually a night club at the weekends with the usual "issues"that such a place incurs. Felt slightly uncomfortable as we walked past on a Saturday with police everywhere and a lot of shouting and screeming (and that was just the girls!) Appears to have something happening every day - according to the advertising outside. Cavernous inside. Bit too young for the old gits like me.